Do you like skiing but hate lugging your ski gear on buses and walking what feels like miles to get to the slopes? 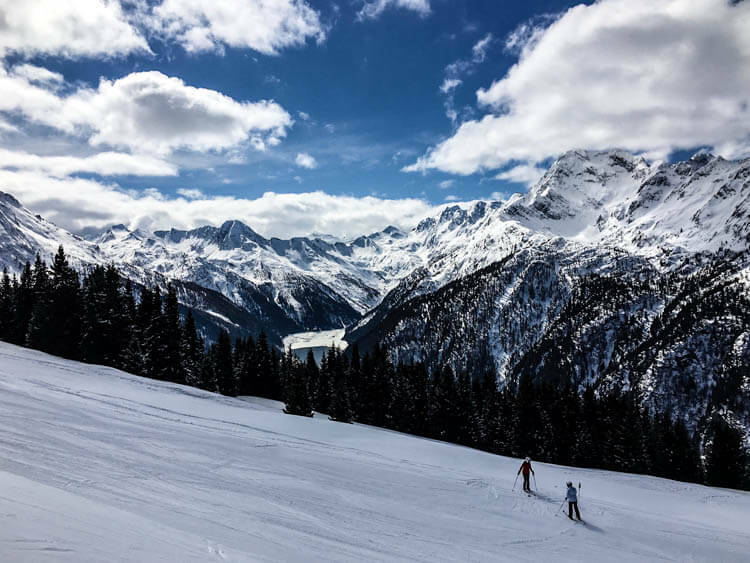 Then Aprica, a small town in the Valtellina province in the north of the Lombardy region of Italy, is the perfect winter destination. 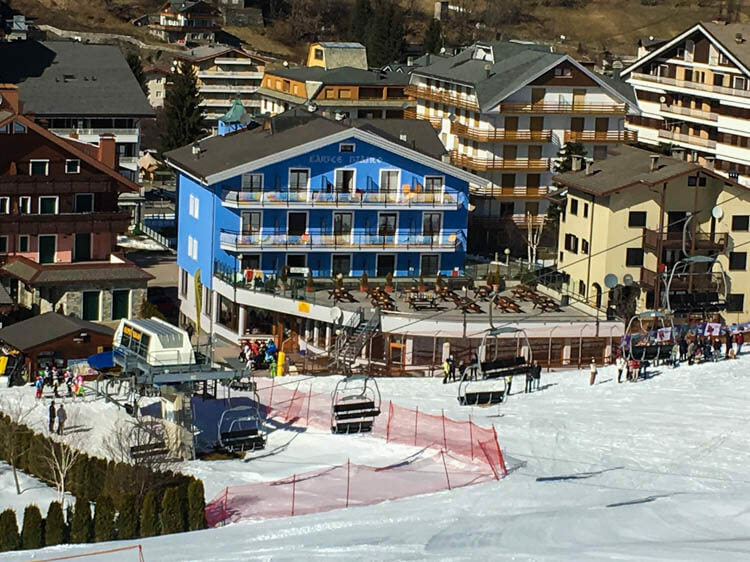 Aprica Ski Resort is perfectly situated with over 20 hotels within a few minutes from the slopes, many of them which you ski directly up to from the three main ski runs that descend to the town. 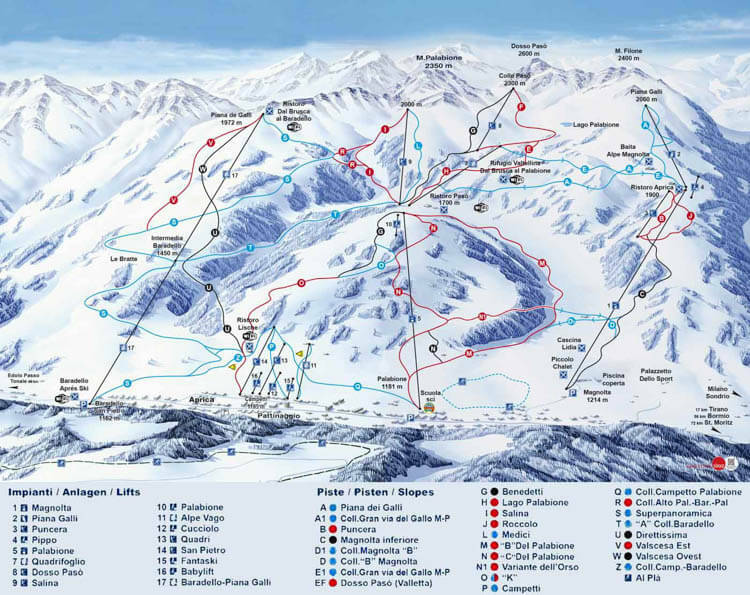 The resort features 50 kilometers of groomed pistes all well connected by 18 ski lifts. The ski area is nicely laid out for beginner and intermediate skiers, but it does have a few runs to challenge those more experienced. With slopes above 2000 meters you’ll have good snow for the better part of winter. Aprica also has snow making across 80% of the ski area to help out when mother nature isn’t cooperating. The views from the Piana Galli slope are a spectacular showcase of the Begamo Alps. Truly the views are some of the best I’ve come across in Italy. The resort also has eight restaurants or chalets on the slops so you can enjoy some some great mountain food while taking in the views. With the mountains running in an east-west direction, the ski runs are situated on mostly north facing slopes; this leads to some great snow conditions late into the spring. 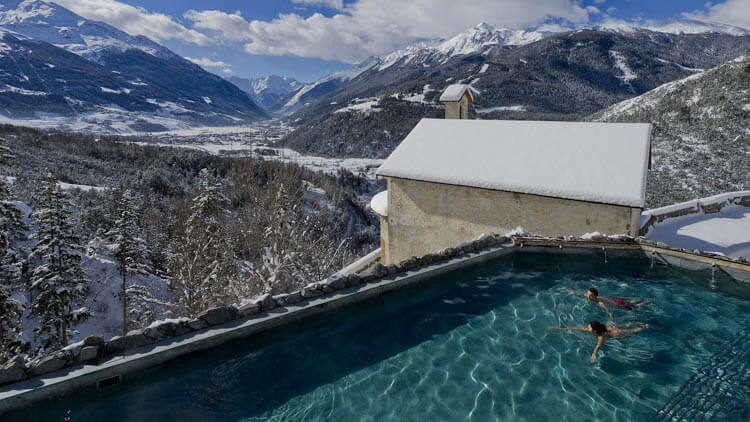 If winter sports aren’t your fancy then a visit to the fabulous wellness spas of Bormio may be in order for you. The thermal spas are fed from nine hot springs coming down from Mount Reit. They have been popular since Roman times and were even a favorite of Leonardo Da Vinci. A trip to Terme Bagni Vecchi or Bagni Nuovi would make for a great day of relaxation and is less than a 10-minute drive from town. A ski trip doesn’t get any better than being able to ski directly to your hotel. Hotel Larice Bianco is situated perfectly at the bottom of the lift. I love being able to catch the first ride up the mountain in the morning. Nothing beats skiing on freshly groomed snow. After all, nobody enjoys hiking miles in their ski boots to catch a ski shuttle or to the lift stations. With a large sundeck and attached bar it makes the the perfect place to relax after a day on the slopes. My trip was provided by InLombardia365 as part of the #InLombardia365 campaign in cooperation with iambassador in order to bring you this story. However, Luxe Adventure Traveler maintains full editorial control of the content published on this site. As always, all thoughts, opinions, and enthusiasm for travel are entirely our own. This article contains affiliate links. When you book on Booking.com through our affiliate site, we earn a small commission at no additional cost to you. As great as the skiing looks the thermal spa would be my favorite! I would love to swim in that pool. It looks so relaxing. I was in this area in September, driving across the north of Italy. Of course, in September, it looked a little different! Snow or no snow, it is a spectacularly beautiful part of Italy. I am personally not much of a skier, but as long as I can participate in apres ski, than I’m all set! I love compact resorts like this! When we lived in Europe and did ski seasons, we always picked resorts where people could live on the mountain – I hate lugging my skis around on buses etc! 50km of piste would make for quite a cute little resort, perfect for a few days – and that swimming pool couldn’t be in a better location! Love the scenery. Never been skiing, not really my thing, but I would try snowboarding. I like the way the resort looks. What wonderful views! I’ve flown over the Italian Alps during winter and always thought the area was just gorgeous. And I love that the thermal spas are so close by. Perfect for relaxing after a day of hitting the slopes! Okay, skiing is something I’ve wanted to try for YEARS now. Italy would be such an epic place to go skiing for the first time, especially at the Aprica Resort! Those views are breathtaking… especially from the pool! What a beautiful property, thanks for sharing!